On Monday evening I had the chance to chat with Brad, the man who tends the plot to the west of mine. We briefly swapped notes about what we're growing in our gardens, and then we turned to the subject of birds. Always a favorite topic. "You know, there's a mockingbird who wants to claim the rights to your plot," he said with a smile. "Yes, I know. He was sitting up there on the trellis when I was here on Saturday. He must have sat there for a good 20 minutes or so, singing his little heart out. He has a lot to say, apparently." 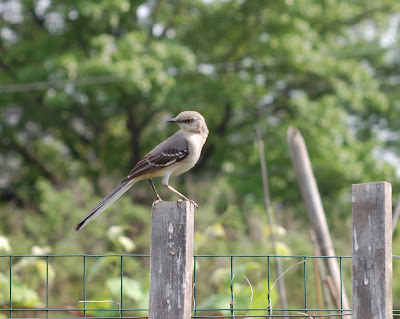 And so it is that I have a friendly mockingbird that makes regular visits to my plot. When I'm in the garden I thoroughly enjoy having a front-row seat from which to watch him sing his melodious aria. That is, except for the times when he stops to give a good long glance at my ripening strawberries. Don't. Even. Think. About it. 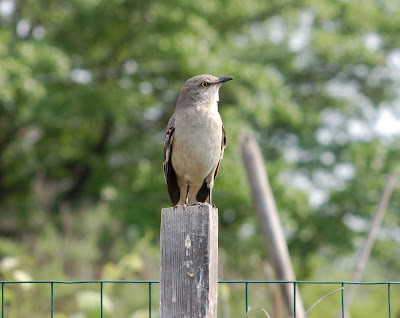 I had only intended to write about my encounters with the persistent, strawberry-seeking mockingbird today, but this morning I read some astonishing news about other birds -- and in particular, about birds here in the Washington, D.C. area. On the front page of the Express (a free daily publication of The Washington Post), a lead story about West Nile virus was titled, "Where have all the birds gone?" And in the photo caption with the story: "Crows have been hit particularly hard by West Nile virus. In D.C., 90 percent have died." Ninety percent of the crows in D.C. have died?! Wow. That statistic was shocking to me. It seems as if it was only a few years ago when we first heard the reports about West Nile virus affecting birds in our area. I can't believe so many crows have since died. Crows certainly aren't the most endearing of birds, but this makes me wonder: How is the loss of so many crows affecting other species? Everything is connected. "In the Northeast, for example, chickadees have dropped by 53 percent and the Eastern bluebird is down 44 percent. In Maryland, American robins took an especially large hit, with the virus apparently responsible for a 32 percent population reduction." Unbelievable. And sad, really. The article goes on to note that the best thing people can do to curb the spread of West Nile virus is to remove any sources of standing water in their yards (where mosquitoes, the carriers of the virus, breed). The Post referred to a study published today in the journal Nature. I love your little bird, I've never seen one close up. We have them here but I was never much of a bird watcher until about 10 years ago so I'm still learning to recognoze some of them. That's very disturbing news. Over here in Britain a great many of our sea birds are decreasing in number, puffins in particular. The BBC are broadcasting a programme about the matter next week. All very worrying, because, as you say, we are all interconnected in the web of life. I love your photos of the mockingbird...just great! Hi, thank you for your visit, interesting article about the virus that is affecting so many birds, we get things like that over here affecting certain animals, you realy have to wonder if it is what we are doing to the planet that is causing all of this. Love your flower pictures especially the batchelor button picture, something that bit different. I have added your link to my blog , are you happy to exchange? I have a mockingbird gardening buddy, too. We get along, he serenades me from the garden tower while I work, but I do think he considers the garden space his. That bird info is scary. Right now, we are seeing lots of crows, but have been warned to call the state wildlife office if we see a dead one on the ground. There must be a problem with dead birds here, too. Thank you for a reminder of how connected we are to the world through birds. We need to be examining the same connection to bees. I love your blog, and am now a VERY regular visitor. Keep up the great work -- we love it! Your little mockingbird is very sweet. Crows still seem very plentiful here, fortunately, but I had no idea so many birds were dying elsewhere. The birds, the bees, the oaks - our beautifu planet Earth, it's so sad. What a cool photo sequence with the mockingbird and your comments. I had no idea that West Nile was affecting the bird populations so heavily - it's good that you have written about this.